The 'Enhanced Humans, Robotics and the Future of Work' Project is primarily funded by the Australian Research Council's Discovery Projects scheme. The key aim of the project is to assess the impacts that advances in robotic and artificial intelligence (AI) technologies are having on society. The project will do this by exploring the sociological impacts of the current seismic shifts in automation, robotics and AI and how demand is created for digital skills around mobility and mobile technology. Some of the topics that will be focused on in this research will include: what future workplaces will look like; how capital-intensive and labor-saving dimensions of robotics and AI transform work/life balance and underpin emergent mobile forms of employment; and how forms of physical mobility (such as travel and transport for employment) and digital mobility (such as e-work, e-commerce and e-services) are being developed within companies and organisations in response to the demands of technological change. The project is split into three streams, each with a specific sub-focus relating to the social impact of robotic and AI technologies. 'FlexLean Production Line' by Zen wave (CC BY-SA 4.0), via Wikimedia Commons. Technological innovations in robotic and automated devices are potentially unleashing a transformation in work and employment as far-reaching as the industrial revolution. Economists have predicted that technological developments - especially breakthroughs in robotics - now threaten entire professions. However, such predictions have often been based on an overly ‘deterministic’ understanding of the impact of new technologies. This overlooks the social and cultural complexities of exactly how such technologies are becoming deployed in workplaces in very different ways across different industries, to different ends. These issues will be investigated through a series of in-depth semi-structured interviews conducted with people from selected workplaces in which advanced robotic and AI technologies are being used. In addition interviews will be conducted with workers displaced from a cross-section of industries currently undergoing a shift to automation, including manufacturing, mining, agriculture, transportation and logistics. We’re currently looking for individuals to participate in short interviews with us so that we can find out about how technologies are transforming your workplace. ‘Google prototype self-driving car’ by Marc van der Chijs (CC BY-ND 2.0), via Flickr. Stream 2 will investigate the social impacts that are 'embedded' into the development of robotics. Dr Thomas Birtchnell and his team will examine how new ways of working are envisaged by the developers themselves; the new digital skills that will be required to work with such innovations; and, the ethical considerations at play. Informing this stream will be a series of semi structured interviews with organizers and participants from key robotic and AI technology forums. Such forums provide important collaborative spaces for the people involved in the development and take-up of robotic and AI technologies. The specific forums from which participants will be recruited include those based around educational competitions, trade meetings and community networks. This research will be supplemented by further interviews with mainstream robotics developers located within academic and industry based institutions. This will provide insight into how mainstream developers anticipate the social impacts of their technology, what, if any, mitigation strategies they put in place in relation to these impacts and the skill sets they envisage will be required by the future users of that technology. 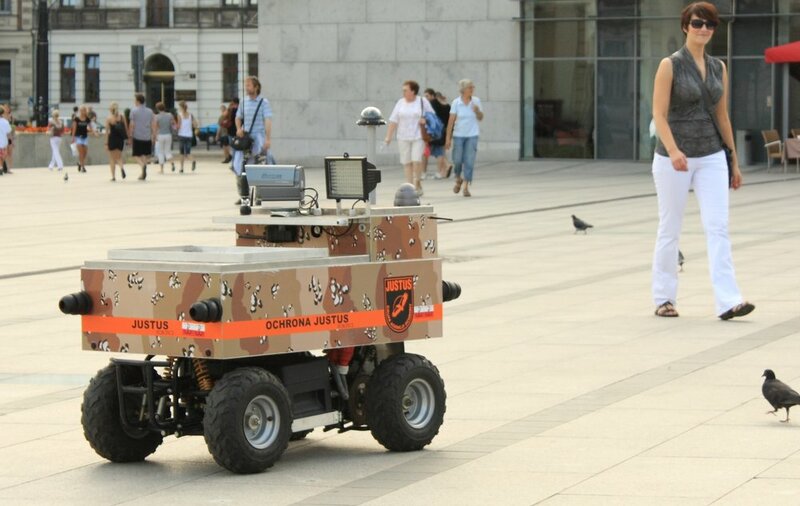 'Justus robot in Krakow Poland', by Matti Paavola (CC BY-SA 3.0), via Wikimedia Commons. Under the supervision of Professor Anthony Elliott, stream 3 will give the research an important international focus. This stream will identify how advances in robotics and AI are affecting the people who engage with these technologies on a daily basis in different parts of the world. Some of the affects that will be studied include how robotics and AI technologies are impacting on the work/life balance of people, creating new life chances and risks and promoting new forms of physical and digital mobility. The in-depth interviews underpinning this stream will be conducted in a number of OECD member states, including Australia, Germany, The United Kingdom, Ireland and Japan. This will allow comparisons to be made between the different experiences of people involved in the production, design and uptake of robotics and AI technologies across a number of locations and cultural contexts. The research of stream 3 will thus provide insights into both how globally uniform the experiences of people engaged in the production, design, and uptake of robotic/AI technologies are, and how the experiences of Australian developers and workers compare to those residing in other developed countries.